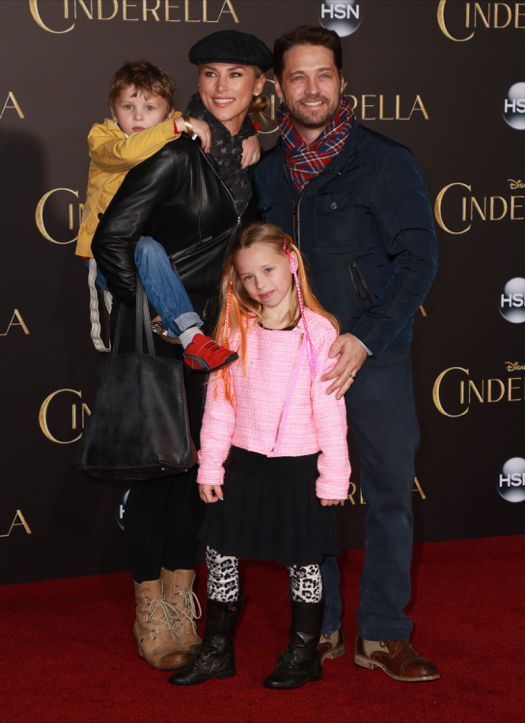 Jason Priestley, his wife Naomi Lowde and their children Ava & Dashiell attended the Los Angeles premiere of Disney’s Cinderella at the El Capitan Theatre in Hollywood, CA on Sunday (March 1st). The Haven actor was all smiles dressed in a navy jacket, matching jeans and shoes. He wrapped his arm around his daughter while his wife held their son on her pack as they posed for pictures. Priestly admitted his greatest achievement is being a father. In the memoir, the Canadian-native speaks of his life and his time spent playing Brandon Walsh on Beverly Hills 90210.